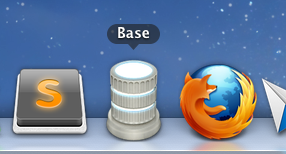 After trying a bunch of SQL Lite managers, I have found a little gem: Base. What is not to like, besides be stable, solid and can handle most of the things I throw at it. 3. Execute regular SQL commands. I am beginning to really like SQLLite for prototyping and of course you can graduate to proper SQL later but this is really nice and am glad that I am settling for Base for the time being. Highly recommend it, it is very cheap as well.